Don't miss out on updates from FIRE! FIRE > Newsdesk > Top Story > Don’t miss out on updates from FIRE! Don’t miss out on updates from FIRE! We know our work defending student and faculty rights on campus matters to you, and we want to ensure you don’t miss any important news from FIRE. Social media is a great way to keep up with our newest victories and campaigns, but Facebook is making some changes to its News Feed so that users will see more posts from their Facebook friends, and fewer posts from pages like FIRE’s. However, you can ensure you don’t miss any updates simply by following the instructions in the image below. 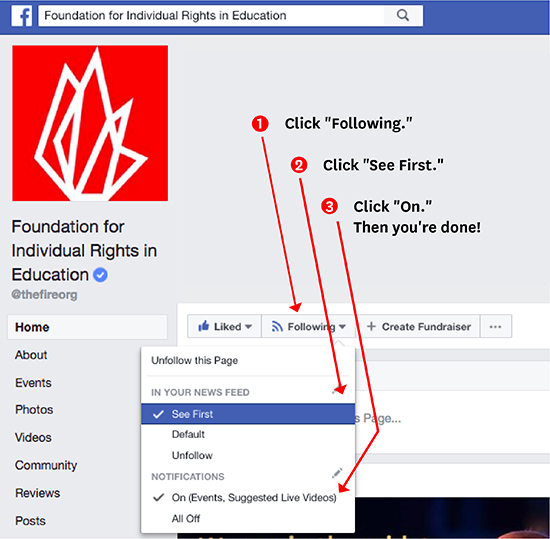 In addition to following FIRE on Facebook, don’t forget that you can also follow us on Twitter at @TheFIREorg.